Worldwide Industrial Tools and Solutions Company Atlas Copco New Zealand Provide Top-Quality Vacuum Equipment and Services. Industries around the world have been utilising the state-of-the-art solutions, services and materials provided by industrial giants Atlas Copco New Zealand for over one hundred years – with their vacuum pump technology proving to be a particularly vital innovation. Described as “the new standard in vacuum pump technology” by Brian Jack, CTS Aftermarket Sales of Atlas Copco’s Hamilton branch, the vacuum equipment and services Atlas Copco supplies are every bit as versatile, resilient and energy-efficient as the many other products created by this leading international company. Invaluable throughout industries such as manufacturing and electronics, vacuum pumps are also widely utilized in scientific study, often used to remove air and gas particles from any given container. From electric bulbs to surgical equipment, glass coating and more, the versatility of vacuum technology has proven essential in maximising productivity and minimising downtime in a wide variety of industries. 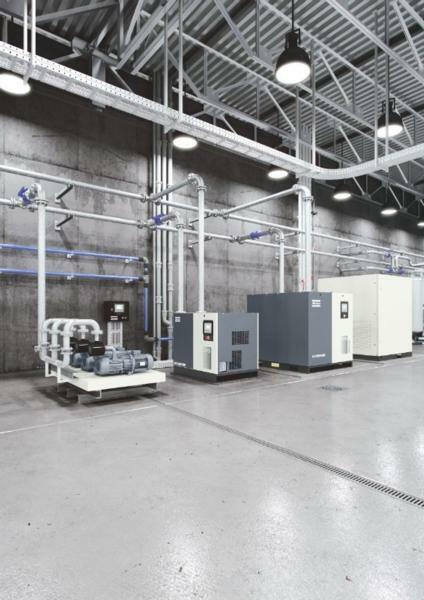 Doubts raised about the efficiency and energy cost of this equipment spurred Atlas Copco into producing vacuum technology unrivalled in the industrial market. Their GHS VSD+ vacuum pump is the first big innovation in rough vacuum pumps this century, and offers an average of 50% energy savings, silent technology, clean operation, and a compact, all-in-one package and benefits from Atlas Copco’s proven compressor technology. “Using rough vacuum has always meant high oil carryover, loud noise and high energy costs. But why should you stick to tradition when there’s no more need to compromise?” Brian asks. Atlas Copco products are also well known for their resilience; corrosion-resistant and fully serviceable, much of their equipment – including their vacuum solutions – can be both installed and maintained by professional Atlas Copco service technicians, ensuring their customers maintain an ongoing connection and access to service that is friendly, efficient and loyal. Whatever equipment you may need, Atlas Copco can help. To learn more about their products and solutions, click here! Based in Stockholm, Sweden, Atlas Copco provides efficient and innovative industrial equipment, with over 40, 000 employees and customers in over 180 countries. With a vision of “First in Mind, First in Choice,” Atlas Copco have become internationally renowned for the safety, sustainability and durability of the many different solutions and innovations they provide. Their products and services include compressors, vacuum solutions and air treatment systems, construction and mining equipment, power tools, assembly systems, and more.